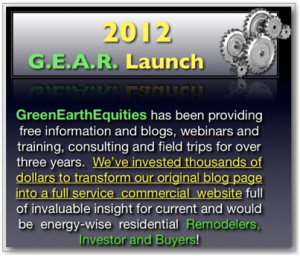 Over a year in the making, GreenEarthEquities is ready to launch its 2012 Added Value Membership Service! GEE’s invested decades, developing and refining the expertise necessary for successful energy wise house flipping. For years we provided an array of free educational services to our many green building partners. As part of our completely redesigned website we’ve added hundreds of hours of webinars and training videos and continue to upload value packed information. We’re excited to debut this new and improved site to better share decades of our expertise and provide a user friendly forum for a growing number of interested and concerned green building and industry partners. Join us this Tuesday at 6PM (PT) and see how easy it is join G.E.A.R. We’ll have a look at all we presently offer and be taking your suggestions as to how we can be of further service. Looking forward to working with and for you as together we help Save the Planet, One Foreclosed House at a Time.. This entry was posted on Wednesday, January 25th, 2012 at 5:29 pm and is filed under EnergyWise House Flipping, G.E.A.R. MEMBERSHIP, Investors Webinars, Renovators Webinars. You can follow any responses to this entry through the RSS 2.0 feed. Both comments and pings are currently closed.